The food on the plane. Meals on the plane. A photo. Video. Meals on board the aircraft. Meals on the plane - a collection of drinks and food, which offers passengers the carrier during the flight. Typically, the cost of food is included in the ticket price. On the flight, small in the distance, no hot meals are served, offering hot and cold drinks and snacks. Menus and serving depend on the class of the ticket and the airline. First and Business Class fully supplied with glass cups and crockery, various menus, economy class, in turn, offers passengers a cardboard and plastic utensils. Most airlines offer their customers to pre-order the special food that meets certain requirements: kosher, vegetarian, low-calorie, lean diabetics or for Hindus. The airline is ready to use every opportunity to become a unique galley. For cooking meets a group of chefs, among them the American working Suzanne Goin and master Georges Blanc, whose names are known in culinary circles. Passengers who are in the first grade, may prefer to Japanese dinners Kyo-Kaiseki, which originated in the XVI century and was preceded by the tea ceremony in Japan. Kyo-Kaiseki - it's not just the food but the whole art artful balance of flavors and many visual elements. Ancient Chinese Ming Zhen Jia Zhuang - "culinary creation from a reputable and well-known creators." This dish includes double-boiled soups, snacks popular "Xiao Cai", desserts, created in a modern style to old traditions. Equally delicious are the other dishes: Lobster Thermidor with asparagus and butter, braised quail with Chinese sausage and chestnuts. 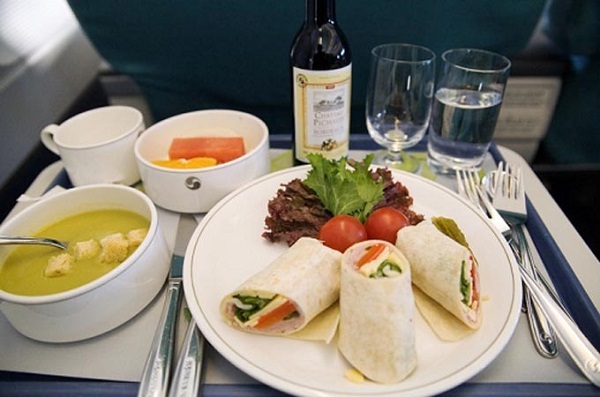 Not much variety in terms of food is economy class, which includes a selection of international and Asian cuisine. For younger travelers representatives of airlines offer ice cream. The national airline of the UAE is characterized by the best chefs in the world, who work on board the aircraft. They prepare excellent meals and snacks. Do not be indifferent to a rich selection of wines. It is difficult to book a table in a good restaurant «Nobu» Japanese cuisine? This airline will help to realize your dream. To create an original menu on board the aircraft are four famous chefs including Nobu Matsuhisa, whose restaurants are all over the world. First Class and Business Class offer fine cuisine that meets the level of the restaurant: crockery and table linen. Menu starts with a traditional Arabian cold snacks called meze, followed by Iran, or a mixture of grilled salmon in the Indian, and the end of the main dishes - pancakes with cheese, mushrooms and tomato sauce, stuffed with spinach. Passengers of first and business class have the opportunity to use the "chef on call," calling and identify with dishes from twenty five options relevant to the menu. They can indulge in papillote cod, stewed lamb, shrimp and many other dishes. Be sure to pay attention to the classic Malaysian dishes: beef or chicken kebab for peanut sauce that managed to receive the award as the best specialties in the Skytrax World Airline Awards poll. Last year, Turkish airlines received 5 prize places, 3 of which went for meals on board the aircraft in different classes: business class, premium economy and economy. This is really deserved: the back of the aircraft is used as a place for secondary processing of various products, where they can cook meat and artichoke, deliciously prepare a stuffed eggplant. Another feature - a huge number of special dishes: from people with religious restrictions and ending with raw food. Moreover, on board the aircraft can offer dishes for individuals who do not tolerate gluten. Anyone can order a birthday cake, a holiday or honeymoon. And the most effective way to end the meal, Turkish delight and authentic Turkish coffee. Three consecutive years of Australian company managed to occupy the third place in the polls Skytrax World Airline Awards as the best business-class cuisine. Moreover, it is exactly the same as Etihad Airways, invites the onboard chef. But be that as it may, the most original service is a Viennese coffee house service Airlines customers can decide with a cup of coffee out of the eleven types of such beverage. Clients' Business Class and First Class on intercontinental flights, airlines are treated to professional chefs whose restaurants are awarded Michelin stars. And the airline changes 2 chefs every month, reaching a huge variety on the menu. If you suddenly liked some of the dishes offered, the company's website, you can familiarize yourself with the recipe. Without cholesterol, low fat - LFML. No added salt - LSML. Without dairy products - GFML. Rough food (multifilament products): vegetables, fruits, multifilament cereals, nuts, legumes. Strict vegetarian (herbal products) - VGML. Vegetarian with dairy products and eggs - VLML. Asian vegetarian except for root crops and products of animal origin - AVML. SFML - Seafood in conjunction with stewed vegetables and fresh. Muslim - MOML (does not contain gelatin, pork, fish with no fins or scales, alcohol and various flavoring extracts with alcohol). The Hindu - HNML (contains no veal, beef or pork, but includes poultry, lamb, and other types of fish, meat). For the followers of Jainism - VJML (vegetarian dishes with special Indian spices, with no animal products and root vegetables such as mushrooms, onions, garlic, ginger, carrots, potatoes, beets, radishes, etc.). For children up to 2 years - BBML (puree in jars). For children up to 2 12 years - CHML. Of course, if you choose a business class, then you certainly will feed something more varied and tasty. This meal will be served on plates with normal cutlery, rather than in a separate plastic container. It is worth noting that there are very cheap flights that do not feed at all, save on food or feed for an additional fee. You can choose a ticket and save on travel. Typically, travel agencies offer tour charters economy or direct flights with meals on board. How to order a special meal? If you are not a vegetarian, you can order a set meal to your preference without any explanation. But it is important to order in advance: at least 24-36 hours before the flight (depending on the specific airline rules). Make a food order on our website, if you have purchased a ticket online, or to order by number of reservation service. If the flight parameters change (or the date of the flight), you need to confirm your order for food on the plane again. "Ural Airlines" it is necessary to notify about their tastes for 24 hours before departure. In this case you will be prompted to set all 4: baby, vegetarian, fish and light refreshments. On charter flights to Egypt and Turkey is not a special meal is provided. The "Aeroflot" order can be issued not less than 36 hours before the flight. The range of fifteen kinds of food. Exactly the same conditions "Donavia" partner companies and "Russia". "Transaero" offers not order less than a day. When buying or booking tickets from Domodedovo, Vnukovo and Sheremetyevo available about twenty kinds of food, including 4 kind of vegetarian food. In the Lufthansa may place an order for food to 24 hours. They offer a selection of seventeen different menu dishes. As for special food, it is available only if the flight lasts more than 75 minutes in first and business class and more 185 minutes in economy. Air France takes orders for food on the plane is not less than 48 hours before the flight. Selection is available from eleven dishes and only on those flights that last more hours 2 35 minutes. The airline will listen to your preferences on the menu only if the order has been issued for the 24 hours before the flight. Japanese food can be ordered only in business class to / from Tokyo. British Airways is ready to take orders for the Muslim or kosher menu for 48 hours before the flight, the rest of the menu - for 24 hours. Qatar Airways handles orders for the special menu for 72 hours before the expected departure. In the list of proposals includes eighteen kinds of special food. Products supplied on board an aircraft, are prepared in accordance with Islamic principles. Cathay Pacific Airways is to warn about their taste preferences for food 24 hours. They offer twenty-one version of the food. In the business class and first class basic Chinese dish is usually served with a bowl of jasmine rice fumed. On long-haul flights in economy class for a dessert served ice cream. You find yourself in the spotlight: the inevitable question, interest, surprised looks. Sets special meal more standard. New gastronomic discoveries perfectly brighten up the road. The food prepared for you individually and not on the line. According to research scientists, any choice of food on the plane can seem tasteless. And it's not the fault of suppliers or cooks. Recent studies have shown that the air dulled sense of taste. At an altitude of nine thousand kilometers virtually all dishes seem fresh, no matter how delicious they were. Sugar is perceived to 15-20% weaker than the earth, and salt - to 20-30%, the coffee does not taste bitter, and dry wines often seem to acidic. Do not lose the taste only tomato juice, so it usually ends up in the first plane. What we can take for a snack on the plane? Many people fly planes on a business trip, vacation, visit, etc. Often, the flight takes more than two hours and involves several changes. And in order for tea, juice and coffee is not to give a round sum, it is better to take care of his stomach and take with meals on board. Not everyone knows what to take food on the plane is allowed. This may be not only those products that you bought in duty-free. Experienced travelers taking with it not only chocolate and biscuits, and home-made, such as a salad container, sandwiches, etc. Note that there is a limit on drinks, which are already often carried by flight attendants. But it is necessary to adhere to certain recommendations regarding the choice of products. Seasoned travelers are advised to take those foods that are rich in protein: beef, chicken, nuts and cheese. It is important that the food did not have a sharp odor, it does not spoil quickly and does not crumble. the liquid should be packed show on the control desk before boarding the aircraft. How can I order a special meal?